A well situated 4 star comfortable family home at the end of a quiet village street. 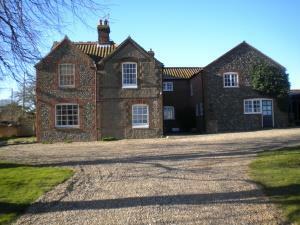 Home Close is within half a mile of the North Norfolk coastline and has spectacular views towards Blakeney Point. Ideal for walking, bird watching, cycling, sailing, stately homes, gardens and many other attractions. There are plenty of excellent pubs and restaurants close by. Internet access available. The grid shows the prices and daily availability from Sun 21 Apr 19 to Sat 27 Apr 19. It's easy to check availability for particular dates; just use the calendar to choose the check in date, select the number of nights and click the 'Search' button. Click the Book button to book the highlighted days. With Book the room booking will be confirmed immediately, with Book the room reservation will be confirmed within 24 hours..
Take A148 Fakenham to Cromer Road. Turn left onto B1156 and continue to Langham. In middle of village turn right by Church into Morston Road. Home Close is the last house on left, just past school on right. The property is not suitable for people with wheelchairs as the bedroom is upstairs and there is no lift.